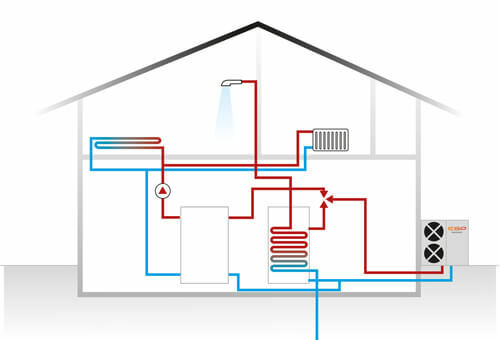 Frequently asked questions about ground and air source heat pumps. 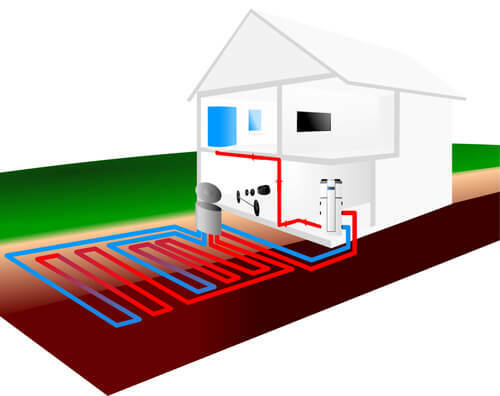 Ground source heating systems are electrically powered and work by tapping the natural heat that is stored in the earth to heat your home. In addition to heating your home, a heat pump can also cool your home during the summer months, as well as heating your swimming pool and your domestic hot water. You will be able to use radiators and under-floor heating to distribute heat throughout your home. While the best option for optimal efficiency and benefit for a heat pump would be under-floor heating, you could also use extra or oversized radiators. This will really depend upon your heating needs in comparison to the size of the system that you design and install; and, Is your home currently being completed? If this is the case, it will be much cheaper to install an air source heat pump, along with underfloor heating systems, during the construction stage instead of waiting until everything is complete. We are group of experienced heat pump installers and heating engineers with a passion for renewable energy. Our group of heat pump installers hold a range of different accreditation and certifications. Our residential and commercial heat pump services, products and solutions are cost effective and we draw on the wealth of experience and knowledge of our installers to meet the specific requirements of our customers. Our heat pump systems are designed and installed to the highest of standards and delivered and installed on time. We understand what it takes to make the customer happy and we pride ourselves on our customer's satisfaction. We will always be professional, polite, courteous and helpful. Heat Pump Source works in partnership with the following UK renewable energy websites.